In this concise and engaging new volume, the latest in our growing Western History Series, Professor Broussard examines how African Americans over the course of nearly five centuries attempted to find their place in the states and territories west of the ninety-eighth meridian. Although black westerners, like white immigrants or native-born whites, defy easy characterization because they came to the West for a variety of reasons, blacks have shared certain commonalities with these groups. The majority of African Americans who settled in the West saw the region as a place where they could fashion a better life for themselves or their families. Some naively viewed the West as an oasis, a place free of racial or class restrictions. While many white immigrants, native-born whites, Hispanics, and Asians also saw the West as a place of opportunity, the experiences of African Americans differed profoundly from whites, people who never faced such a pervasive pattern of discrimination based solely on their race. In addition to covering central themes and important figures, Expectations of Equality tells the stories of every-day African American men and women, persons who lived in the West from the early 1500s until the turn of the twenty-first century. Many of them led ordinary lives that are difficult to reconstruct in detail–working, raising families, attending church, and educating their children. 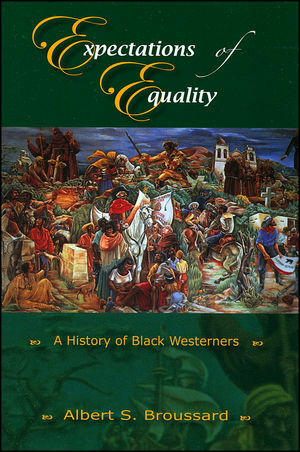 Yet some of them forged colorful careers as scouts and mountain men, Buffalo Soldiers, businesswomen, athletes, activists, and politicians, their stories helping to make Expectations of Equality the perfect choice as supplementary reading—not only for courses in the history of the U.S. West, but also for survey courses in United States and African American history. Albert S. Broussard is professor of History and the Cornerstone Faculty Fellow in the department of History at Texas A&M University. A former president of the Oral History Association, he has published Black San Francisco: The Struggle for Racial Equality in the West, 1900—1954 (1993) and African American Odyssey: The Stewarts, 1853-1963 (1998).